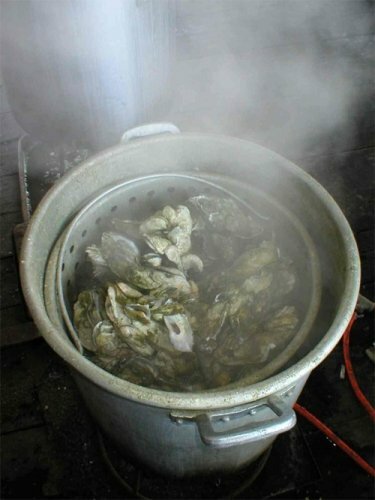 The oyster roast is a celebration of community and the bounty of the sea, two of South Carolina‘s most enduring qualities. This shot was taken by Abby Wells of Charlotte in February 2007. Abby writes: “Bowen’s Island is a secret well-kept from tourists and other non-native Charlestonians. Along with a very lucky group of co-workers from Charlotte, I was invited to this particular oyster roast as part of a weekend retreat and regional sales meeting being hosted by our Charleston colleagues. “About 12 years ago, I had the extreme good fortune of living in the Charleston area, on the Isle of Palms. At that time I was indoctrinated by local friends on the ins and outs of oyster roast etiquette. #1 – A proper Charlestonian does not eat her shucked oysters straight off of her oyster knife. #2 – ‘Wear something comfortable’ does not mean the same thing to all people, especially the fine ladies of Charleston, who wear very trendy, very cute outfits to oyster roasts without getting a speck of plough (“pluff”) mud on them, and keep a lipstick in their pocket for post-shucking touch-ups. Real women know how to open their steamed oysters. I am, however, a Tidewater VA woman, and some of us may not wear cute, trendy clothes especially in February — great month for oysters — but the deal is to be cheerful in all kinds of weather whilst remaining outside indulging.